Everyone's a winner! | First Option Software Ltd.
…so goes the 1970s Hot Chocolate chart hit, and it’s true! 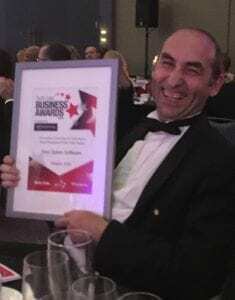 Despite not actually winning the coveted award itself at the recent South Coast Business Awards, the team at First Option Software are immensely proud of reaching the final selection in one of eight prestigious categories. A few of the team enjoyed a grand night out at the Ageas Bowl in Southampton for a slap-up dinner last month at the glittering black tie awards ceremony that saw local businesses come together for the event which is run annually by The Daily Echo and aims to raise standards, encourage competition, and recognise business excellence across Hampshire and the Isle of Wight. The category we were nominated as finalists for – Best Small Business of the Year – is sponsored by Hampshire Chamber of Commerce and we offer our congratulations to worthy winners, Dynamite Recruitment Solutions, and all the other finalists and winners on the night. It was a great night out, everyone was happy and we look forward to next year’s awards, when we hope to take home the big prize! 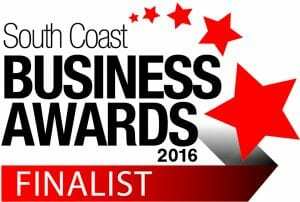 We have also entered the Solent Business Awards 2016, results of which will be announced at an awards dinner in October, again at The Ageas Bowl, so keep watching this space for good news!